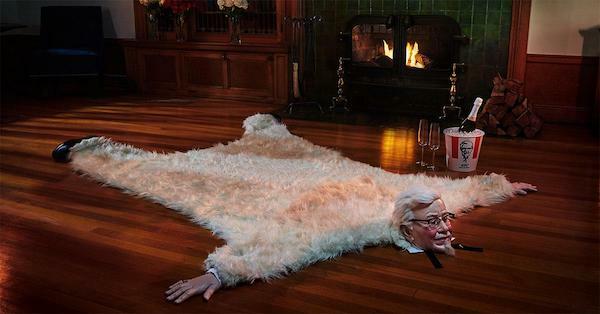 KFC strives to fill your home with tender-loving care with its new Valentine’s Day date night package, which includes a one-year streaming subscription and… a bearskin rug created in the likeness of founder Colonel Harland Sanders. To celebrate the day of romancing, the fast food chain has rallied Reddit users to engage in a Photoshop battle of its new—and totally not creepy—rug featuring Colonel Sanders’ head, hands and feet. The wittiest edits will hold claim of the limited-edition faux bearskin centerpiece, presumably to spice up the love lives of those who seek the company of another in their homes. Along with the rug, the most creative souls will also receive two fried chicken-inspired onesies, a gift card for a one-year subscription at an online streaming service, and a gift card entailing a year’s worth of KFC date nights for two. Fret not if your photo-editing skills aren’t as crisp—KFC has also prepared a writing prompt and drawing duel, so anyone can get a piece of the Colonel. If all else fails and you can’t get clucky this Valentine’s Day, there’s nothing like a bucket of chicken and a glass of wine to do the trick. Take a look at some of the funniest Photoshop edits of the rug after the scroll, and find out more here.